For other uses, see Executive order (disambiguation). Not to be confused with Presidential proclamation or Presidential memorandum. 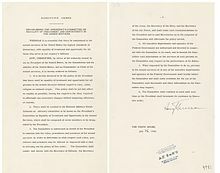 Executive Order 9981 of July 26, 1948 by President Harry S. Truman banning segregation of the Armed Forces. Executive orders are published in the Federal Register. Here, Executive Order 13799 of Donald Trump is reproduced. In the United States, an executive order is a directive issued by the President of the United States that manages operations of the federal government and has the force of law. The legal or constitutional basis for executive orders has multiple sources. Article Two of the United States Constitution gives the president broad executive and enforcement authority to use their discretion to determine how to enforce the law or to otherwise manage the resources and staff of the executive branch. The ability to make such orders is also based on express or implied Acts of Congress that delegate to the President some degree of discretionary power (delegated legislation). Like both legislative statutes and regulations promulgated by government agencies, executive orders are subject to judicial review and may be overturned if the orders lack support by statute or the Constitution. Major policy initiatives require approval by the legislative branch, but executive orders have significant influence over the internal affairs of government, deciding how and to what degree legislation will be enforced, dealing with emergencies, waging wars, and in general fine-tuning policy choices in the implementation of broad statutes. As the head of state and head of government of the United States, as well as Commander-in-Chief of the United States Armed Forces, only the President of the United States can issue an executive order. Presidential executive orders, once issued, remain in force until they are cancelled, revoked, adjudicated unlawful, or expire on their own terms. At any time, the President may revoke, modify, or make exceptions from any executive order, regardless if the order was made by the current president or a predecessor. Typically, a new president reviews enforced executive orders in the first few weeks in office. The United States Constitution does not have a provision that explicitly permits the use of executive orders. The term executive power in Article II, Section 1, Clause 1 of the Constitution is not entirely clear. The term is mentioned as direction to "take Care that the Laws be faithfully executed" and is part of Article II, Section 3. The consequence of failing to comply could possibly be removal from office. The U.S. Supreme Court has held that all executive orders from the President of the United States must be supported by the Constitution, whether from a clause granting specific power, or by Congress delegating such to the executive branch. Specifically, such orders must be rooted in Article II of the US Constitution or enacted by the congress in statutes. Attempts to block such orders have been successful at times when such orders exceeded the authority of the president or could be better handled through legislation. The Office of the Federal Register is responsible for assigning the executive order a sequential number after receipt of the signed original from the White House and printing the text of the executive order in the daily Federal Register and eventually in Title 3 of the Code of Federal Regulations. With the exception of William Henry Harrison, all presidents, beginning with George Washington in 1789, have issued orders that in general terms can be described as executive orders. Initially, they took no set form. Consequently, such orders varied as to form and substance. The first executive order was issued by George Washington on June 8, 1789, addressed to the heads of the federal departments, instructing them "to impress me with a full, precise, and distinct general idea of the affairs of the United States" in their fields. The Emancipation Proclamation was an executive order, itself a rather unusual thing in those days. Executive orders are simply presidential directives issued to agents of the executive department by its boss. Until the early 1900s, executive orders went mostly unannounced and undocumented and seen only by the agencies to which they were directed. That changed when the Department of State instituted a numbering scheme in 1907, starting retroactively with United States Executive Order 1 issued on October 20, 1862, by President Abraham Lincoln. The documents that later came to be known as "executive orders" apparently gained their name from this order issued by Lincoln, which was captioned "Executive Order Establishing a Provisional Court in Louisiana". This court functioned during the military occupation of Louisiana during the American Civil War, and Lincoln also used Executive Order 1 to appoint Charles A. Peabody as judge, and to designate the salaries of the court's officers. President Truman's Executive Order 10340 in Youngstown Sheet & Tube Co. v. Sawyer, 343 US 579 (1952) placed all steel mills in the country under federal control. This was found invalid because it attempted to make law, rather than clarify or act to further a law put forth by the Congress or the Constitution. Presidents since this decision have generally been careful to cite which specific laws they are acting under when issuing new executive orders. Likewise, when presidents believe their authority for issuing an executive order stems from within the powers outlined in the Constitution, the order will simply proclaim "under the authority vested in me by the Constitution" instead. Wars have been fought upon executive order, including the 1999 Kosovo War during Bill Clinton's second term in office. However, all such wars have had authorizing resolutions from Congress. The extent to which the president may exercise military power independently of Congress and the scope of the War Powers Resolution remain unresolved constitutional issues, although all presidents since its passage have complied with the terms of the resolution while maintaining that they are not constitutionally required to do so. President Truman issued 907 executive orders, with 1,081 orders by Theodore Roosevelt, 1,203 orders by Calvin Coolidge, and 1,803 orders by Woodrow Wilson. Franklin D. Roosevelt has the distinction of making a record 3,522 executive orders. Prior to 1932, uncontested executive orders had determined such issues as national mourning on the death of a president, and the lowering of flags to half-staff. President Franklin Roosevelt issued the first of his 3,522 executive orders on March 6, 1933, declaring a bank holiday, forbidding banks to release gold coin or bullion. Executive Order 6102 forbade the hoarding of gold coin, bullion and gold certificates. A further executive order required all newly mined domestic gold be delivered to the Treasury. By Executive Order 6581, the president created the Export-Import Bank of the United States. On March 7, 1934, he established the National Recovery Review Board (Executive Order 6632). On June 29, the president issued Executive Order 6763 "under the authority vested in me by the Constitution", thereby creating the National Labor Relations Board. In 1934, while Charles Evans Hughes was Chief Justice of the United States (in the time period known as the Hughes Court), the Court found that the National Industrial Recovery Act (NIRA) was unconstitutional. The president then issued Executive Order 7073 "by virtue of the authority vested in me under the said Emergency Relief Appropriation Act of 1935", reestablishing the National Emergency Council to administer the functions of the NIRA in carrying out the provisions of the Emergency Relief Appropriations Act. On June 15, he issued Executive Order 7075, which terminated NIRA and replaced it with the Office of Administration of the National Recovery Administration. In the years that followed, President Roosevelt replaced the outgoing judges with those more in line with his views, ultimately appointing Hugo Black, Stanley Reed, Felix Frankfurter, William O. Douglas, Frank Murphy, Robert H. Jackson and James F. Byrnes to the Court. Historically, only George Washington had equal or greater influence over Supreme Court appointments, choosing all of its original members. Justices Frankfurter, Douglas, Black, and Jackson dramatically checked presidential power by invalidating the executive order at issue in The Steel Seizure Case (i.e., Executive Order 10340). In that case Roosevelt's successor, President Truman, had ordered private steel production facilities seized in support of the Korean War effort, but the Court held the executive order was not within the power granted to the President by the Constitution. Large policy changes with wide-ranging effects have been implemented through executive order, including the racial integration of the armed forces under Harry Truman and the desegregation of public schools under Dwight D. Eisenhower. Two extreme examples of an executive order are Franklin Roosevelt's Executive Order 6102 "forbidding the hoarding of gold coin, gold bullion, and gold certificates within the continental United States" and Executive Order 9066, which delegated military authority to remove any or all people in a military zone (used to target Japanese-Americans and German-Americans in certain regions). The order was then delegated to General John L. DeWitt, and subsequently paved the way for all Japanese-Americans on the West Coast to be sent to internment camps for the duration of World War II. President George W. Bush issued Executive Order 13233 in 2001, which restricted public access to the papers of former presidents. The order was criticized by the Society of American Archivists and other groups, who stated that it "violates both the spirit and letter of existing U.S. law on access to presidential papers as clearly laid down in 44 USC 2201–07", and adding that the order "potentially threatens to undermine one of the very foundations of our nation". President Barack Obama revoked Executive Order 13233 in January 2009. The Heritage Foundation has accused presidents of abusing executive orders by using them to make laws without Congressional approval and moving existing laws away from their original mandates. In 1935, the Supreme Court overturned five of President Franklin Roosevelt's executive orders (6199, 6204, 6256, 6284, 6855). Executive Order 12954, issued by President Bill Clinton in 1995, attempted to prevent the federal government from contracting with organizations that had strike-breakers on the payroll; a federal appeals court subsequently ruled that the order conflicted with the National Labor Relations Act, and invalidated the order. Congress has the power to overturn an executive order by passing legislation that invalidates it. Congress can also refuse to provide funding necessary to carry out certain policy measures contained with the order or to legitimize policy mechanisms. In the case of the former, the president retains the power to veto such a decision; however, the Congress may override a veto with a two-thirds majority to end an executive order. It has been argued that a congressional override of an executive order is a nearly impossible event, due to the supermajority vote required and the fact that such a vote leaves individual lawmakers vulnerable to political criticism. On July 30, 2014, the Republican-led House of Representatives approved a resolution authorizing Speaker of the House John Boehner to sue President Barack Obama over claims that he exceeded his executive authority in changing a key provision of the Affordable Care Act ("Obamacare") on his own and over what Republicans claimed had been "inadequate enforcement of the health care law", which Republican lawmakers opposed. In particular, Republicans "objected that the Obama administration delayed some parts of the law, particularly the mandate on employers who do not provide health care coverage". The suit was filed in the U.S. District Court for the District of Columbia on November 21, 2014. Executive orders may, for example, demand budget cuts from state government when the state legislature is not in session, and economic conditions take a downturn, thereby decreasing tax revenue below what was forecast when the budget was approved. Depending on the state constitution, a governor may specify what percentage each government agency must reduce by, and may exempt those that are already particularly underfunded, or cannot put long-term expenses (such as capital expenditures) off until a later fiscal year. The governor may also call the legislature into special session. There are also other uses for gubernatorial executive orders. In 2007, for example, George "Sonny" Perdue, governor of Georgia, issued an executive order for all of its state agencies to reduce water use during a major drought. This was also demanded of its counties' water systems, but it is unclear whether the order would have the force of law. According to political expert Phillip J. Cooper, a presidential proclamation "states a condition, declares a law and requires obedience, recognizes an event or triggers the implementation of a law (by recognizing that the circumstances in law have been realized)." Presidents define situations or conditions on situations that become legal or economic truth. These orders carry the same force of law as executive orders—the difference between the two is that executive orders are aimed at those inside government while proclamations are aimed at those outside government. The administrative weight of these proclamations is upheld because they are often specifically authorized by congressional statute, making them "delegated unilateral powers." Presidential proclamations are often dismissed as a practical presidential tool for policy making because of the perception of proclamations as largely ceremonial or symbolic in nature. However, the legal weight of presidential proclamations suggests their importance to presidential governance. ^ "What is an Executive Order?". Insights on Law and Society. Vol. 17 no. 1. American Bar Association. Fall 2016. ISSN 1531-2461. Retrieved January 1, 2018. ^ SCOTUS, Myers v. United States, 272 U.S. 52 (1926), Majority Opinion. ^ Southern reporter: Cases argued and determined in the courts of Alabama, Florida, Louisiana, Mississippi. West Publishing Company. 1986. p. 723. ^ Chester James Antieau; William J. Rich (1997). Modern Constitutional Law: The states and the federal government. West Group. p. 528. ISBN 978-0-7620-0194-1. ^ American Bar Association (January 1971). ABA Journal. American Bar Association. p. 35. ISSN 0747-0088. ^ President of the United States. "Executive Orders". archives.gov. Office of the Federal Register. This article incorporates public domain material from websites or documents of the National Archives and Records Administration. ^ 93rd Cong., 2nd sess. (1974). Executive Orders in Times of War and National Emergency: Report of the Special Committee on National Emergencies and Delegated Emergency Powers, United States Senate. U.S. Govt. Print. Off. p. 23. ^ DiBacco, Thomas V. (2014-08-14). "DiBACCO: George Washington had a pen, but no phone, for executive orders". The Washington Times. Archived from the original on 2016-05-14. Retrieved 2017-02-04. ^ Brian R. Dirck (2007). The Executive Branch of Federal Government: People, Process, and Politics. ABC-CLIO. p. 102. ^ a b Lord, Clifford et al. Presidential Executive Orders, p. 1 (Archives Publishing Company, 1944). ^ Relyea, Harold C. (26 November 2008). "Presidential Directives: Background and Overview" (PDF). Congressional Research Service. p. 1. Order Code 98-611 GOV. ^ a b c Gerhard Peters. "The American Presidency Project / Executive Orders". Retrieved 26 August 2015. 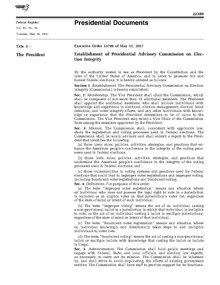 ^ American Presidency Project, Executive Order 7075 (5/29/2009). ^ a b c d "Executive Orders". Federal Register. Retrieved 2016-11-10. ^ "Executive Orders". White House Briefing Room. Retrieved 2017-06-16. ^ "Executive Order 13489 of January 21, 2009 — Presidential Records". Retrieved 2009-01-22. , Federal Register publication page and date: 74 FR 4669, January 26, 2009. ^ Gaziano, Todd F. (2001-02-21). "The Use and Abuse of Executive Orders and Other Presidential Directives". Legal Memorandum #2. The Heritage Foundation. Retrieved 2008-10-11. ^ "Chamber of Commerce of the United States, et al, v. Reich, 74 F.3d 1322 (D.C. Cir. 1996)". Public.Resource.org. Retrieved 7 November 2014. ^ Parker, Ashley (21 November 2014). "House G.O.P. Files Lawsuit in Battling Health Law" – via NYTimes.com. ^ "Federal court halts Trump's immigration ban". The Verge. 2017-01-28. Retrieved 2016-01-28. ^ Phillip J. Cooper. 2002. By Order of The President. University of Kansas Press. Page 116. ^ Presidential Proclamations Project, University of Houston, Political Science Dept. Bush, Ann M., "Executive Disorder: The Subversion of the United States Supreme Court, 1914-1940" [Amazon], 2010. Mayer, Kenneth R., With the Stroke of a Pen: Executive Orders and Presidential Power, Princeton University Press, 2002. Warber, Adam L., Executive Orders and the Modern Presidency: Legislating from the Oval Office, Lynne Rienner Publishers, 2006. Wikimedia Commons has media related to Executive orders of the United States. Presidential Proclamations Project, University of Houston, Political Science Dept.